Short analyses of lines in Macbeth. Mainly as an excuse to post this picture. Having momentarily freed himself from the influence of Lady Macbeth’s entreatments to murder Duncan, Macbeth attempts to sort out his conflicting feelings and decide upon a course of action. While thus engaged, Macbeth asks himself what Duncan has done to deserve a premature death and goes on to describe how, if he were to kill the king, “pity, like a naked newborn babe / … / Shall blow the horrid deed in every eye” (1.7.21-24). Through the personification of pity as a baby, an object whose connotation is one of helplessness and innocence, Shakespeare indicates Macbeth’s guilt at having grim intentions towards such a harmless subject as Duncan. This characterizes Macbeth as a man seemingly ruled by his morals (at least when left to his own devices) rather than by fear or other motivation as demonstrated by his change from balking at the murder of his king only because it presented potential danger to his own person to a moral obligation to his king and country. This is, so far, in keeping with what little else has been learned about Macbeth thus far: his performance in battle is a testament to the fact that he is not ruled by his fear and his resistance to his “fate” and his wife’s suggestions shows that he is largely motivated by morals. 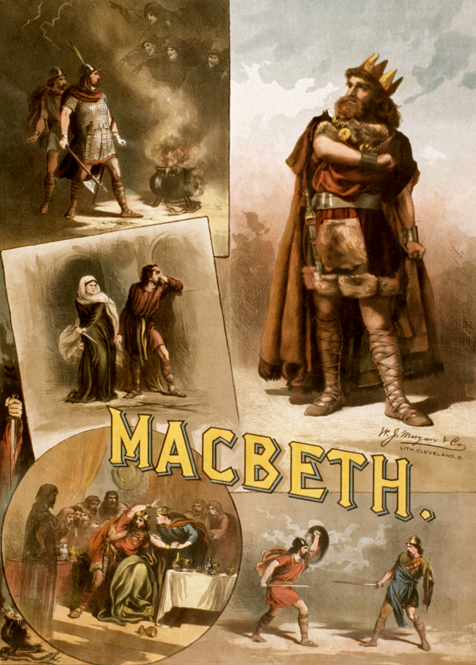 However, Macbeth remains a conflicted character, easily swayed, and at a loss to obey his own feelings. Following Banquo’s departure at the beginning of Act III of Shakespeare’s Macbeth, the play’s titular character soliloquizes about his growing fear of Banquo. Macbeth finds the reason for his apprehension in the Weïrd Sisters’ prophecy, claiming that “Upon [his] head [the witches] placed a fruitless crown / And put a barren scepter in [his] grip,” (3.1.66-67). Shakespeare uses the connotation of the word “barren” (childless or unable to bear children) to create a metaphor for Macbeth’s lack of an heir to carry on his newly formed line, a predicament placed on him by the prophesy which heralded Banquo’s, not Macbeth’s, children as kings. Such a situation completely denies Macbeth power—the object of his designs. Possessing progeny means having a method of perpetuating oneself, which, to Macbeth, constitutes ultimate power, as kingship for a mere lifetime cannot satisfy his new insatiable ambition. Banquo gains immortality through the granting of a legacy and moreover a royal one, while Macbeth gains nothing from ruling as king as his line will not continue: hence the second metaphor of the fruitless crown which bears him no benefit (even after the “labor” he underwent to secure the position represented by the crown). Furthermore, Macbeth does not blame himself for his plight as he indicates that these useless and unrewarding symbols of kingship were “placed” and “put” in his hands, supporting earlier evidence characterizing him as quick to complain and spot peril, but slow to act. This paranoia reflects also in Macbeth’s identification of Banquo as a threat because he wields the power of progeny, a paranoia which leads Macbeth to plan a second murder—a murder which signifies that his character has passed the point of no return as he designs to murder a father and son without the slightest compunction or indeed any moral objection. Here are two good words to know: eponymn and eponymous. The first means the person after whom something is named; the second, having something named after. So, Macbeth is the eponymous protagonist.